Commuting to work by electric bike has increased in popularity over the last few years. With demand, comes supply and electric bikes are becoming more and more adaptable. A lot more thought is now going into design, including an emphasis on weight and comfort, as some people commute for long periods of time. Below are some of the best commuting electric bikes on the market. The West Hill Electric Bike (Learn More Here!) 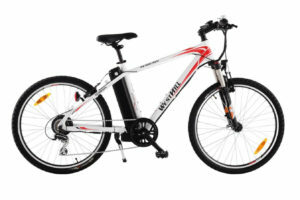 is the newest in the range of electric mountain bikes. It is fitted with a 36-volt battery, which gives the user that little boost if that hill is just a little too steep. It doesn’t prevent the rider from getting exercise as the bike comes with an easy to use pedal assist, which can be controlled on the handlebar. The bike is suitable for those between 5”5 and 6”2. The bike comes with chunky tyres, which makes it great for any terrain. The battery has a 15-mile life even when on high power and it can effortlessly slide out of the frame to make it easier to transport the bike in the car or public transport. The bike is fitted with front and rear lights in keeping with safety standards. 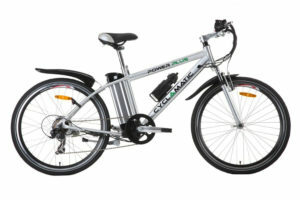 The bike is specially designed so that the motor cannot be damaged unlike most electric bikes by controlling the speed with the pressure that you apply to the pedals. With a pedal assisted motor you add to the power of the fitted motor as well as receiving light moderate exercise in the process as well as being and given a little helping hand up the hill. The folding bike is one of life’s greatest creations. This bike In particular is one of the lightest electric bikes available on the UK market. It has a really light frame, which makes it easy to ride with or without electrical assistance. The bike comes with an LCD display highlighting your speed, battery power, and distance. The bike comes with a 2-year warranty giving customers piece of the mind that the product will last. The bike comes with VOLTTM V Wave technology, meaning the rider can choose 5 different levels of pedal assistance. 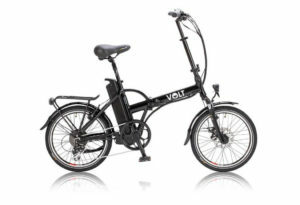 The Volt Metro bike is fitted with Shimano Alivio 8 speed gears giving you a really smooth ride. This bike is the bee’s knee of electric folding bicycles. The 8 Shimano gears are incredibly smooth to use and the bike is a great incentive for those looking to get fit and lose some weight. The battery can remove meaning you can lock away the bike and charge the battery safely and securely. This bike is sleekly designed, it looks beautiful and is very easy and smooth to steer. It’s a great investment for someone wishing to up their cycle game with a sophisticated piece of kit. The Cycleamatic Power Electric Bike is in a world of its own. It features a powerful motor that will get you to 15 mph and comes with a light battery meaning you can transport the bike with ease. The bike comes with Shimano gears and can be used without the motor as a standard mountain bike built with a strong frame. The motor has 2 modes, assisted and full powered. As the names would suggest, the assisted mode will start working as you pedal and just give you that little boost. The Fully powered mode takes you to full speed with no leg movement and the control on the handlebar. The Cyclamatic really is a beast when it comes to style, usability and speed. It’s great for those keen to use both on the street and off road. The assisted mode is great to give you a push off when at traffic lights or up a slow incline. The battery takes around 6 hours to fully charge and helpfully a child seat can be attached easily. All three bikes really are great pieces of kit, they all come with own unique features but the one that really does stand out is the West Hill Pro Terrain. It combines the sturdiness needed to tackle off road and its light enough to be used on the street as a town bike. It comes with 3 levels of pedal assist unlike the other two, which means it really caters for all terrain. It also means you decide how much assistance you need going up hills.